Great Eastern Trail through-hikers Bart Houck and Joanna Swanson cross the Tug Fork River and enter West Virginia, the approximate halfway point on their 1,800-mile, nine-state trek. Accompanying them are TuGuNu Hiking Club members Tim McGraw and Paul Kenney. Snow clung to the hilltops lining the Tug Fork Valley surrounding them, but at river level, it was a rare snow-free day on the trail for Joanna Swanson and Bart Houck as they walked across the bridge separating McCarr, Ky., from the Mingo County town of Matewan WV. 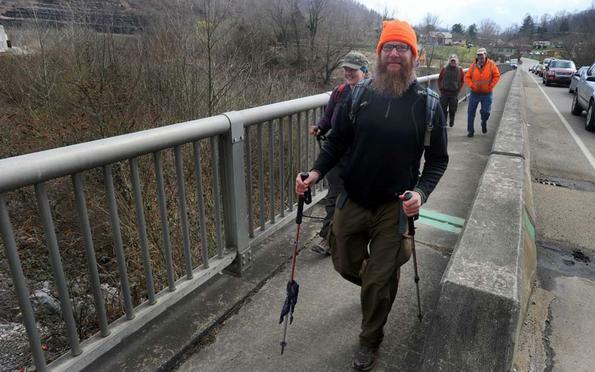 Wednesday’s walk into West Virginia marked the fifth state that Swanson and Houck have entered since beginning what they are determined will become the first through-hike of the 1,800-mile Great Eastern Trail. Extending from the highlands of Alabama to the Finger Lakes region of western New York, the Great Eastern Trail, America’s newest long-distance hiking venue, extends through nine states in all, with West Virginia falling at its midpoint. “After getting to this point, I’m very confident we’ll make it the rest of the way,” said Swanson, a native Minnesotan who served as coordinator of West Virginia’s section of the Great Eastern Trail as a VISTA volunteer based in Wyoming County in 2011. The first half of their journey has been a frosty one for the long-haul hikers. The concept for the Great Eastern Trail is more than 60 years old. Four years after Earl Shaffer completed the first through-hike of the Appalachian Trail in 1948, he proposed opening a parallel route to the west, linking a series of existing trails meandering through a patchwork of state and federal land. As use of the Appalachian Trail steadily increased, with some stretches becoming crowded at times, hikers began to take a fresh look at Shaffer’s proposal. In 2003, the Potomac Appalachian Trail Club and the Southeast Foot Trails Coalition began to discuss the creation of a western alternative to the Appalachian Trail. By 2005, the American Hiking Society and the National Park Service’s Rivers, Trails and Conservation Assistance program joined in the effort, and came up with the name Great Eastern Trail. While segments of the Great Eastern Trail remain sketchy, including much of the section passing through West Virginia, most of the GET incorporates existing long-distance trails, including parts of the Pinhoti Trail in Alabama and Georgia, the Cumberland Trail in Tennessee, and the Pine Mountain Trail in Kentucky. In West Virginia, plans call for the trail to pass through R.D. Bailey Lake Wildlife Management Area, Twin Falls State Park, Camp Creek State Park, Pipestem State Park, and follow the New River through Bluestone State Park and Wildlife Management Area to the Virginia border. The trail then veers into a section of Virginia near Glen Lyn and joins a section of the Appalachian Trail near Pearisburg, where it follows the top of Peters Mountain on the West Virginia-Virginia border before joining the Allegheny Trail and moving back into West Virginia. Plans call for the GET to continue along the Allegheny Trail through Monroe and Greenbrier counties to Lake Sherwood in the Monongahela National Forest, cut back into Virginia for a 150-mile link of connected trails before joining the existing Tuscarora Trail, which passes through an additional 33 miles of West Virginia, and extends through parts of Virginia, Maryland and into Pennsylvania. “This trail showcases 190 miles of West Virginia, and will be great for the state,” said Houck. Several towns along the trail’s route through Southern West Virginia, including Matewan, Mullens, Pineville and Hinton, have already signed on to be Great Eastern Trail host communities and have agreed to blaze the trail through their streets and encourage trail activities. In Southern West Virginia, GET hikers can be expected to use the same amenities that have sprung up to serve motorized trail users on the Hatfield-McCoy Trail. “Both ATV riders and hikers like pizza and cheap places to stay,” said Swanson. While other through-hikers are sure to eventually follow the trail blazed by Houck and Swanson, most trail users are expected to be day-hikers exploring sections of the GET that pass near their homes. “In West Virginia, there will be plenty of bite-sized day hikes,” Swanson said. For the time being, sections of the GET that don’t follow existing trails through public land are routed along less-traveled public roads and highways. Houck and Swanson said their average day on the trail covers 12 to 15 miles, although they have hiked as far as 22 miles in a day. “We’re on the trail at least eight hours a day,” said Houck, who generally carries a pack weighing about 40 pounds, “most of it food.” Swanson said her pack load averages a little less than 30 pounds. To avoid the monotony of cooking and preparing trail meals, “whenever we see a place along the trail where food is available, we veer toward it,” Swanson said. The only form of potentially dangerous wildlife encountered along the trail so far has been a snowy interlude with a wild boar in Tennessee. But all in all, “yard dogs have been our biggest threat,” according to Houck. Along many sections of the trail, local hikers and officers of area trail clubs have accompanied Houck and Swanson on their northward journey. The two have also reported numerous unexpected, but gratefully accepted, offers of food, lodging and refreshment. “The kindness of the people we’ve met along the way has really blown us away,” said Swanson. During their trek through their last stretch of Kentucky into Matewan on Wednesday, Houck and Swanson were accompanied by Tim McGraw and Paul Kenney, president and vice president of the TuGuNu hiking club, based in Wyoming County. “We have a pretty good idea of where we want to go, but it’s not exact, yet,” said Doug Wood of the West Virginia Scenic Trails Association, which is helping to chart the trail’s course through West Virginia. But he’s glad he eventually changed his mind. To follow the journey of Houck and Swanson, who also go by the trail names of “Hillbilly Bart” and “Someday Jo,” go to www.gethiking.net. To learn more about the Great Eastern Trail, visit www.greateasterntrail.net. Woolrich, the Original Outdoor Clothing Company®, is working with the Great Eastern Trail Association (GET), its trail affiliates, and industry partners to maintain and complete the braided walking trail that connects some of the most challenging and beautiful hiking trails stretching from Alabama to New York. The 1,800 mile long GET is currently about seventy-five percent complete. The trail has several gaps where new trails need to be blazed to link the existing trails. Woolrich maintains a portion of the GET that runs through the middle of its hometown via the Mid State Trail. Late last fall Woolrich brought together leadership from the Great Eastern Trail Association, the Keystone Trail Association (KTA), Backpacker Magazine, and other GET associated clubs for a summit in Woolrich, PA. The attendees devised a strategic plan to help with trail maintenance and promote awareness of the trail. Along with providing volunteer gift bags, including a trail work t-shirt, Woolrich hiking socks, and more, Woolrich is supporting its local trail organization, the Keystone Trail Association as the official sponsor of its Trail Care Days. To further increase awareness of the trail Woolrich is collaborating with its long time partner Backpacker Magazine. Woolrich has developed a series of advertorials focusing on the GET that began appearing in the publication in February. Backpacker is integrating content related to the Great Eastern Trail into the presentations of its popular national mobile tour, the Get Out More Tour, which stops at retail stores, events and festivals to educate consumers about the skills and equipment needed to enjoy the outdoors while inspiring healthy, active lifestyles. To learn more about the trail, participating trail clubs, donate or volunteer for a trail maintenance day visit www.greateasterntrail.net. Woolrich Inc., the Original Outdoor Clothing Company, is an authentic American brand that embraces an outdoor lifestyle. Trusted since 1830 by generations of loyal customers, Woolrich continues its tradition of providing quality products for today’s outdoor enthusiast. A brand recognized worldwide, Woolrich product offerings include functional, comfortable and durable men’s and women’s sportswear and outerwear using innovative fabrications for the ultimate in performance capabilities, well-designed home and outdoor living products, and licensed accessory products. In 2010, Woolrich celebrated its 180th Anniversary. It is the original and longest continuously-operating outdoor apparel manufacturer and woolen mill in the United States. Find out more at www.woolrich.com. The Great Eastern Trail (GET) provides a premier hiking experience on a series of existing trails that are being linked to each other into a long-distance footpath in the Appalachian Mountains stretching from Alabama to the Finger Lakes Trail in New York. The trail system is a project of the Great Eastern Trail Association, a non-profit 501(c)(3) organization, which works with the American Hiking Society, sponsors and local trail partners, to create America’s newest long distance trail for hikers. Learn more or donate to the Great Eastern Trail Association at www.greateasterntrail.net.